A new poll shows gubernatorial candidate Joe Dorman, a Democrat and a term-limited state representative, in a surprisingly tight election with incumbent Gov. Mary Fallin. Rasmussen Reports shows Fallin leads Dorman by a remarkably thin 45 percent to 40 percent advantage. Eight percent of those polled are undecided. Seven percent favor independent candidates. The prevailing wisdom among pundits and political observers has been that Fallin would easily coast to victory in Oklahoma’s current conservative political environment, but that narrative has now been shattered by the Rasmussen Poll and an earlier poll by SoonerPoll, which showed a steep drop in Fallin’s approval ratings. It’s difficult not to see the polls, given the dramatic drop in support for Fallin, as a seismic shift in the governor’s race. It appears Fallin is vulnerable at least partially because of her support of controversial and outgoing State Schools Superintendent Janet Barresi, a hardline, high-stakes testing advocate. Barresi came in a lowly third in her recent primary reelection bid and is now serving out the remainder of her lame duck term. Rasmussen Reports points out that Dorman’s main problem is his lack of name recognition throughout the state, but there’s still time to deal with that issue as he travels around Oklahoma. It’s also interesting to note that what some pundits consider Dorman’s greatest liability in Oklahoma-he shares the same party affiliation as President Barack Obama, who is deeply unpopular here-has not manifested itself in any particular manner so far. 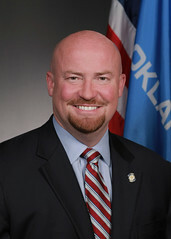 Dorman is a centrist Oklahoma Democrat in the tradition of former Gov. Brad Henry. One reading of the Rasmussen Reports poll-admittedly one favorable for Dorman-is that voters recognize this is a local election with local repercussions that has very little to do with Washington. Have voters here simply become numb or indifferent to the Obama-bashing among state Republican leaders, such as Fallin and Attorney General Scott Pruitt? Has the bashing become stale, in particular, because Obama only has two years left in his last term as president? What’s going to be the point in bashing Obama, for example, once the 2016 presidential campaign gets underway? The Dorman campaign has greeted the new polling with aggressiveness, specifically attacking Fallin on education issues. Meanwhile, the Fallin campaign, in a defensive posture, had to deny rumors that if reelected Fallin might appoint Barresi as Secretary of Education. Fallin’s recent campaign style in her political career as a former U.S. Representative and now governor has been to use at least some extreme Tea Party rhetoric and stylistics. How will voters respond if she now softens her approach and tacks to the center in response to the new poll numbers? It could be problematic for her. I think it’s fair and bipartisan to say that overall Oklahoma could benefit greatly by a close governor’s race because local policy and issues could ultimately decide it. Just fully discussing the issues-like funding for education-might help the state find solutions to some of its pressing problems.